Hey all, here's a mani that didn't go as planned, but I'm liking the result nevertheless! I wanted to make a blue watercolor base, but that already went wrong on the first nail. Lesson 1, don't apply the drops of polish straight from the bottle, you might end up with a huge blob instead of a small drop, haha! So instead of a real watercolor base (apply basecolor, then top coat to protect the base, add small drops of color, take a brush with remover and 'paint' it on the drops of color to create a watercolor effect), it looks more like saran wrap meets remover, or something. I'll tell more about this mani and the top coats further down! I used Go Fast top coat on the basecolor, and after creating the blue effect on top, I used it to seal that in. 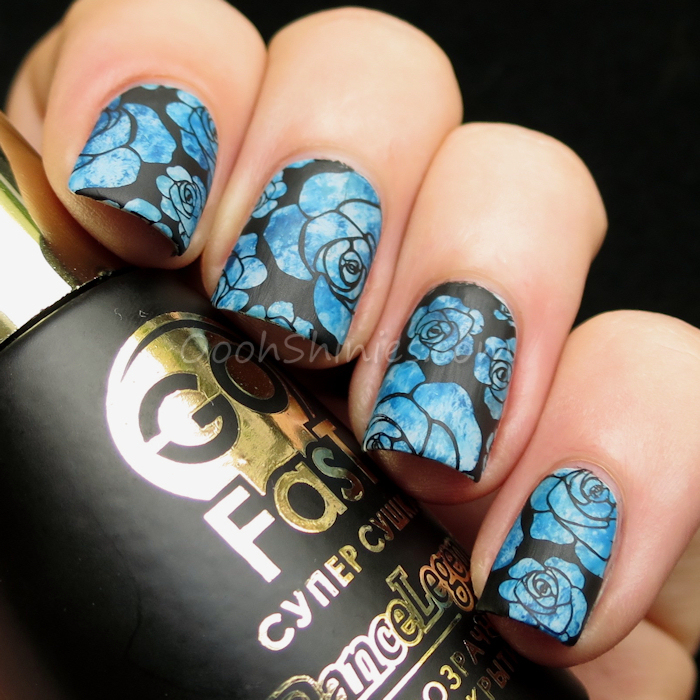 Then I stamped the black rose design, and used Go Fast again. When that was dry, I used Top Satin to finish the mani. 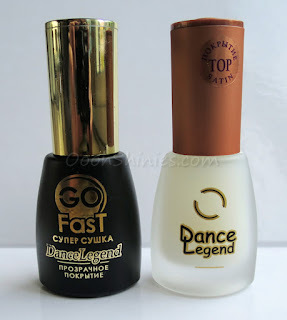 My thoughts: Go Fast indeed does dry quite fast, and it's a thin top coat, which probably helps with that as well. The application is easy, however, you really have to be careful with nail art! Since it's so thin, it's hard to apply it floating, and that makes it easier to streak or smudge your design a bit. 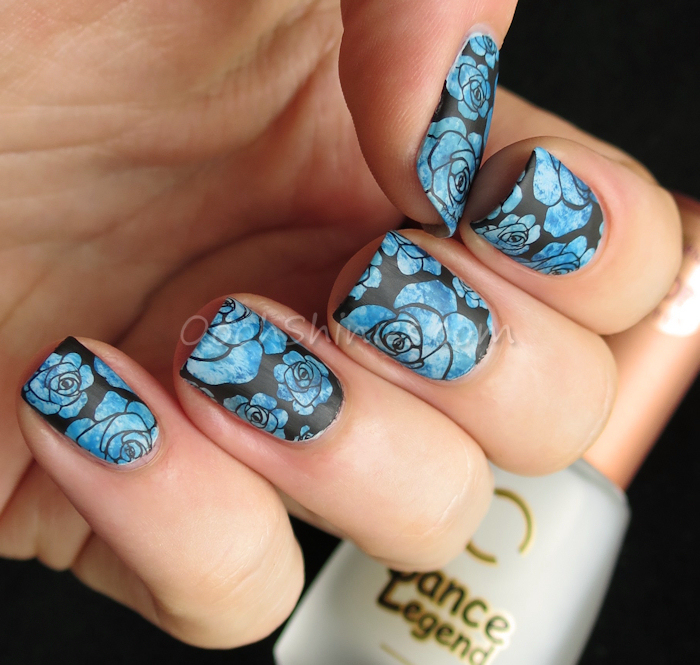 The top coat couldn't really smoothen the slightly bumpy blue base with just 1 coat, but the thin consistency makes it perfect for nail art with a lot of layers that you want to seal in with top coat in between, to keep the finished result thin as well. And as you'll see in a future post, it's also a nice one for stamping decals! Top Satin does exactly what you'd expect of a matte top coat, after applying a decent layer of Top Satin, it gives a satin matte finish as shown in my pictures. It applies smooth and easy, and if you want just a touch of satin finish, you can apply a really thin coat. I like this finish, and how the top coat allows for some variation with the finished result. I always wear a normal top coat between nail art and matte top coat, to prevent the latter from smudging, and Go Fast & Top Satin made a nice team for that! You can find these top coats in various webshops and of course on the Dance Legend website. 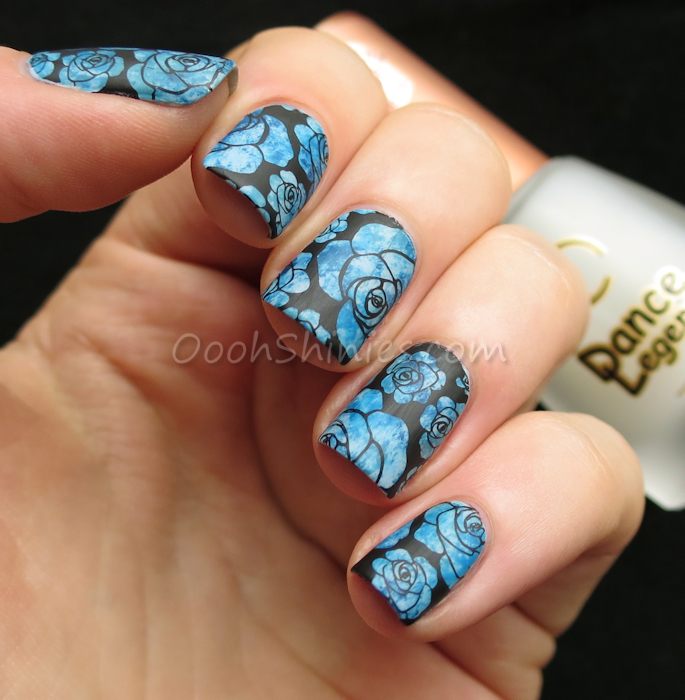 Dance Legend Velvet #655 with OPI I Saw...U Saw...We Saw...Warsaw, A England Galahad, Essence Forever Mine, Konad Black with UberChic Beauty plate UC1-02 and Dance Legend Top Satin.